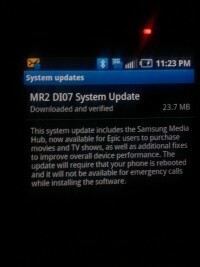 Samsung's DI07 update for Epic 4G adds Media Hub, but does it fix other issues? The Samsung Epic 4G has a new software update available that takes the device from version DG27 (spotted in the build number and baseband version) to DI07. Since it launched on Sprint at the end of last month, users have complained about various issues from inaccurate GPS results (despite functional results in our testing with apps like Google Maps and Foursquare, obtaining a precise location from satellites only is still iffy at best and too often requires a reboot), 3G upload speeds that appear to be capped at 150kbps, poor signal reception and more and are likely waiting to see if those have been addressed. So far, the update details (included after the break) indicate that isn't the case. Getting the update is a matter of luck for now with the servers initially in push mode but when it hits users should have access to the just-launched Media Hub app as well as optimizations for battery power in hotspot mode, performance tweaks and several fixes including one for recognizing 32 GB micro SD cards. Our Epic 4G isn't rocking any new patches no matter how many times we hit Update Android; if you get the update, let us know if you notice any other changes. Update: A few commenters have linked up the zip file for your manual upgrading pleasure. We were able to update using the process and haven't experienced any glitches or instantaneous combustion as a result, though we are feeling even more attractive and intelligent than usual. A demonstration video from AndroidCentral is embedded after the break if you're still curious. How Do I Update The Software On My Sprint SPH-d700 (Epic 4G) Phone To DI07? Samsung has released a software update for the SPH-d700 (Epic 4G) which is recommended to be installed. If the device contains DG27, a notification to update to DI07 should be received. The update process will be performed OTA (Over The Air). It may take several moments to complete. Note: Devices running DI07 will not receive a network notification to update nor will it be available from client side request. DI07 cannot be installed on a device that has DI07 already on it. Note: Devices running the orginal release of DG17, must update to DG27 to receive the DI07 notification. The update process is incremental. Please click here to access the FAQ on how to update to DG27. To check what available version the device has, click here. There are a couple of way to obtain the update, please see on of the sections below. 3. The handset will power cycle and start the installation of DI07. This may take a few moments. Do not interrupt the process by intterrupting power source. When the device reboots, tap Ok to the message. Note: The device will be unable to make and receive calls or messages during the update. Note: The FOTA servers are currently in push mode to update devices. The amount of updates being pushed out is increasing by the day. Client installation of FOTA will report back that there are no software updates available until intial push is complete. * Modified, UI "Noisey" One to "Noisy One"